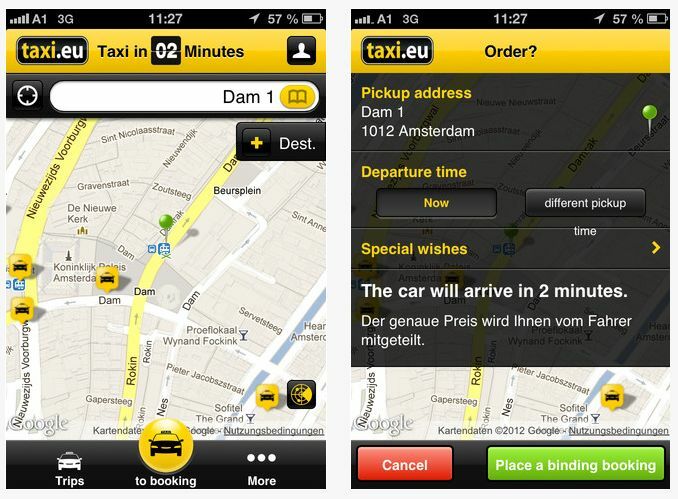 Review: Taxi.eu – The Best Taxi app for iPhone I have Seen! Taxi.eu is no doubt the most handy taxi service app I have seen. Granted I don’t really use an app when I need to call a taxi. I just use one company all of the time. Unfortunately Taxi.eu is a service only available in Europe. This is now a must have app when traveling abroad. Trying to flag down a taxi overseas can be troublesome to certain people. Taxi.eu makes your life a lot easier when you need to get a hold of a taxicab. There are over 40,000 taxis available at your disposal all over Europe. When you first open the app you will notice that the app will use your GPS coordinates to locate you. Next, just type the destination you would like to go to or drag the pin to the location. The app can give you an estimate of what the price will be, along with the distance and duration. You have an option to see all of the taxis real time position and where they are located approximate to you. You can even click on a specific taxi and get more information about it. Once you place your order you can see how long until the taxi will get to your location and you can follow the position of the taxi in real time. If your looking for a specific taxi, you can filter items like: air conditioning, driver speaks English, or even how many passengers are supported. I wish there was a service like this where I lived. It is very cool! Taxi.eu is not only available in Germany but also works in Austria, Switzerland, France, the Netherlands, Denmark and Belgium. The next time your traveling or if your currently located in those countries be sure to download this FREE app. It is available on the Apple App Store.